• 2 nights for 2 adults in Panorama Room. 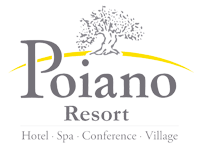 • Dinner in the Poiano Restaurant (drinks included, water and 2 grasses of Poiano wine). • Wine tasting in a wine cellar of Garda Lake (trasport not included). • 1 couple massage of 30 minutes. • 1 entrance of 90 minutes per person, by appointment, to Poiano La Spa Wellness Path (salt lagoon, sauna, hammam, emotional showers). Package price: from € 174 per person. • Credit card guarantee, payment in hotel. • Cancellations: no fee due if made 7 days or more prior to date of arrival, fee of 30% of total cost of stay (charged to credit card) if made 6 days or less prior to date of arrival.